Hollybeary Creations : NND February Release Day 2!! NND February Release Day 2!! It's day two of the February Release sneaks from Newton's Nook Designs and we are sharing Bitty Bunnies today!!! This set is so cute, I think it may be my Favorite from the release, I mean who doesn't love cute bunnies? I created an Aqua card base and then I added some pattern papers from Doodlebug Designs off centered a little. I die cut a banner from the Flags and Frames Die set and stamped the sentiment in a coordinating ink color. This is a pretty clean design for me so I always feel a little out of my comfort zone making these cards. I stamped the bunny image onto some watercolor paper and colored him in with Distress markers and an aqua brush. Once he was dry I used the coordinating dies to cut him out. I adhered the banner over the pattern papers directly and added some foam tape to the bunny image. Comment on the NND blog and Design Team blogs (see list below)! The winner will be chosen at random from the collective reveal posts. Make sure to check out each of their blogs and comment for your chance to win. You will not know which blog has been chosen so the more you comment on the better your chances are of winning! You have until Thursday, February 15th at 9pm EST to comment -- winners will be announced on the blog post on Friday, February 16th. Super cute! Love the bunny! Love how sweet and straight-to-the-point this is! The patterned papers are a great touch! So cute, and love the sentiment. So cute! 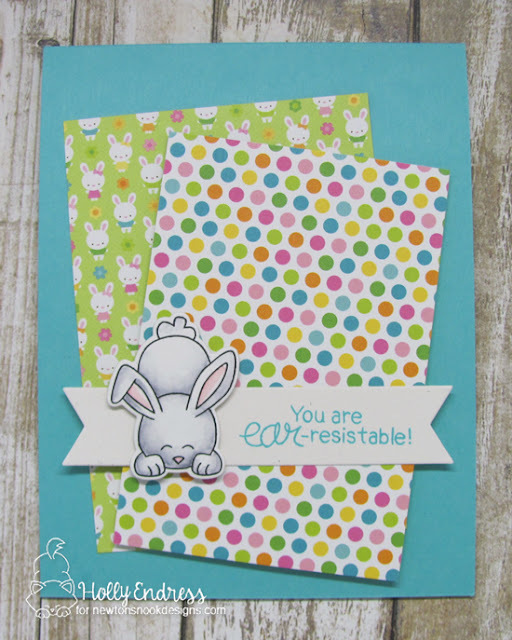 Those patterns go just right with the cute bunny! adorable bunny (he's my favorite!). Super cute bunnies!!! Love the patterned paper coordination too. This stamp set is so fun, beautiful card! I love the colorful pattern papers you choose ! Sweet bunny card! This is an awesome release! Love this! The pattern papers in the background are adorable! So bright and cheerful! Super cute card! Love the papers you matched with the bunny! That bunny is so sweet, and makes a perfect paper weight.